Award-winning cruise-company Hurtigruten is celebrating the return of the newly-refurbished MS Finnmarken to its Norwegian Coastal Voyage itineraries for 2012 – and inviting previous Hurtigruten guests to return as well, with exclusive savings of up to 20%. Designed in an Art Nouveau style reminiscent of the original MS Finnmarken (built in 1912), this 628-berth ship is outfitted with lounges, bars and bistro, conference facilities, fitness room, sauna, swimming pool, and outside Jacuzzis. 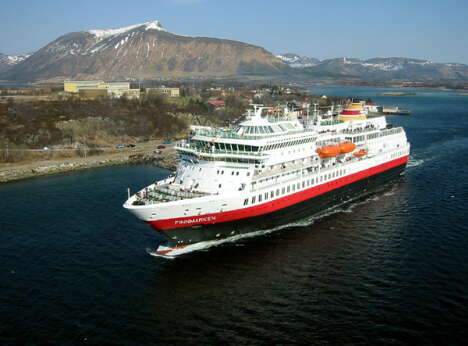 After spending two years as a hotel ship in Australia, the MS Finnmarken will once again join the fleet of 11 Hurtigruten ships offering six to 12-day itineraries along Norway's spectacular west coast, sailing to 34 ports between the cultural center of Bergen and Kirkenes, high above the Arctic Circle. The voyages offer guests a unique glimpse into Norwegian culture – Viking history and myth, the midnight sun, the Northern Lights, stunning fjords and rare glimpses of wildlife at every turn – as well as an exciting array of optional excursions to help personalize the voyage. Members of the 1893 Ambassador Club, a free loyalty club for guests who have sailed a minimum of three nights on any Hurtigruten ship in the past, save up to $2,290 on bookings made by Feb. 29, 2012 for specific voyages between Jan. 1 and May 16, 2012. Discounted fares range from $930 to $9,158 (regularly priced $1,163 to $11,448); higher prices are for suites. Hurtigruten's modern fleet visits 34 unique ports of call as it sails the 1,250 miles between Bergen and Kirkenes, a an itinerary named the "world's most beautiful voyage" by Lonely Planet's "Bluelist." Guests take in an ever-changing landscape of small fishing villages in the rugged Lofoten Islands; Art Nouveau Alesund, the medieval Viking capital of Trondheim; and Tromsø, which was recently selected by Frommer's Guide as a Top 10 Cruise Destination 2012. Optional excursions provide guests with the opportunity to customize the cruise experience: the UNESCO World Heritage Site of Geiranger Fjord praised by National Geographic; a journey across the 71st parallel to the North Cape, home to grazing reindeer and the indigenous Sami people; and the Lofotr Viking Feast, which immerses guests in Viking culture with a visit to the Viking museum and a real Viking feast, complete with home-brewed mead. Guests are encouraged to book optional excursions prior to departure as space can be limited. Rates are subject to availability and include accommodations in cabin or suite of your choice; full board; and entrance to the Hurtigruten Museum (on six-, 11- and 12-day options). International flights, optional excursions and fuel surcharges are additional. The 1893 Ambassador Club loyalty discount reward can be combined with Early-Booking fares and other selected discount programs. Membership in the program is free of charge and its included discounts are for the cruise component only. Guest who have already cruised can join by visiting www.hurtigruten.us/1893 or calling 877-301-3059; new travelers can join the program while onboard their voyage or after returning home.